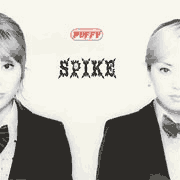 Puffy Amiyumi is a very mixed bag musically. Despite the girls’ massive popularity in Japan (and moderate success in the States), I often find myself highly conflicted about their music. I can’t decide whether it’s superficial pop or subtle Japanese brilliance. Some of it is downright annoying and I occasionally consider purging it from the library. But damn, these girls like to toy with my emotions, and put together something wonderful. With flashes of inspiration like this, I can’t help but give them another chance. The song is COSMIC Wonder from the album Spike. Every time I think i’m ready to ditch those poppy-japanese-rock-girls, I hear the songs that got me interested in the first place. So i explore their music and find myself intrigued, but underwelmed by much of their catalog. Then I start contemplating the removal of the less compelling songs from my library. entering “evaluation mode,” I listen to their songs and can’t help but find most of them catchy and, at the same time, exasperating, with those two reactions constantly fighting each other. Then the cycle begins again. Maybe it’s because they’re Japanese and the cultural differences interfere with my normal reflexes. In any event, Amiyumi is a decent enough record with Usagi Channel being a stand out track. If nothing else, that song is worth keeping around.